A severe weather threat continues to evolve for Eastern and Northeastern Colorado on Saturday this weekend. This is something we will keep a close eye on through the next day or two and at this time it appears Denver and surrounding suburbs will be included in this threat. The current Storm Prediction Center outlook calls for a slight risk for severe weather across East Central, Northeastern Colorado and Western Kansas. Folks living in these areas will need to keep a close eye on the sky Saturday especially in the afternoon hours and especially if you are outdoors or plan to be during this time period. Dangerous lightning will be likely with severe storms. A strong cold front will move through the area late Friday night. This may initially touch off a few strong thunderstorms late Friday but the main threat will establish behind the front on Saturday as the winds become Southeasterly and an up-slope setup establishes along the Colorado front range. As the low moves into Southeastern Colorado, moisture will increase along the front range setting up a sharp dryline just South and East of Denver. 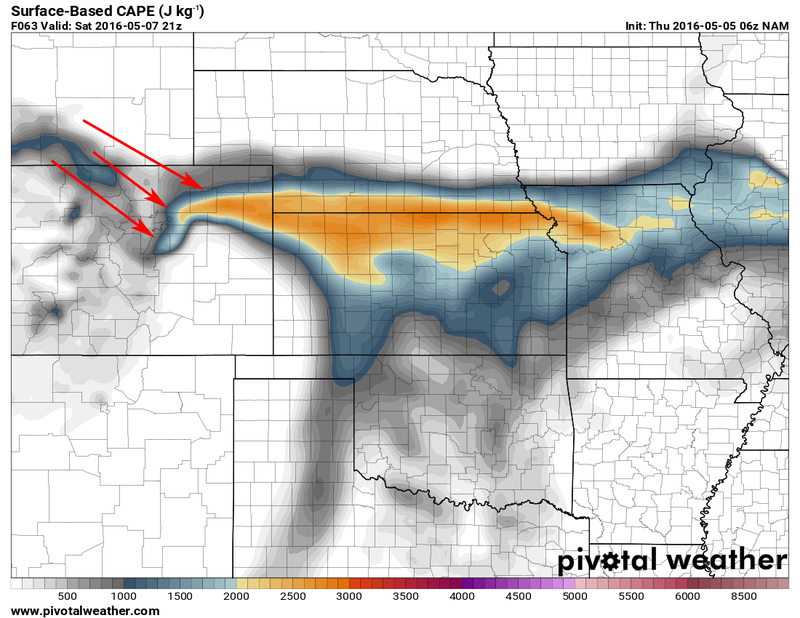 This dryline will be the initial area of concern for severe thunderstorm initiation. The overall setup looks very interesting to me, the profile of where the CAPE (convective available potential energy, how much lift and energy for severe storms over a certain area) fits a very similar pattern that we see in Colorado for severe weather events. 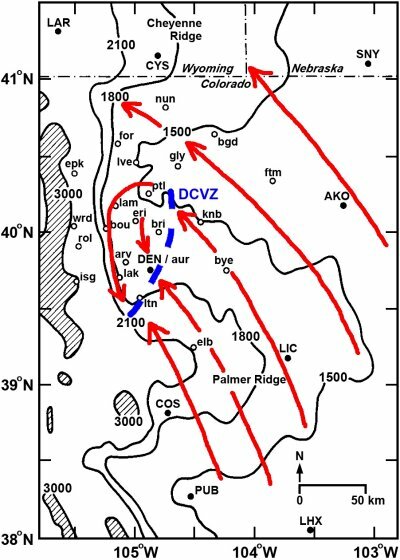 The Denver Convergence Vorticity Zone (DCVZ) is a phenomena we see in Colorado during severe weather season where upslope winds from the Southeast wrap around Denver and turn Northwesterly. This causes the winds to converge East and Northeast of Denver in a line. This convergence boundary is the focus for severe storms and tornadoes. 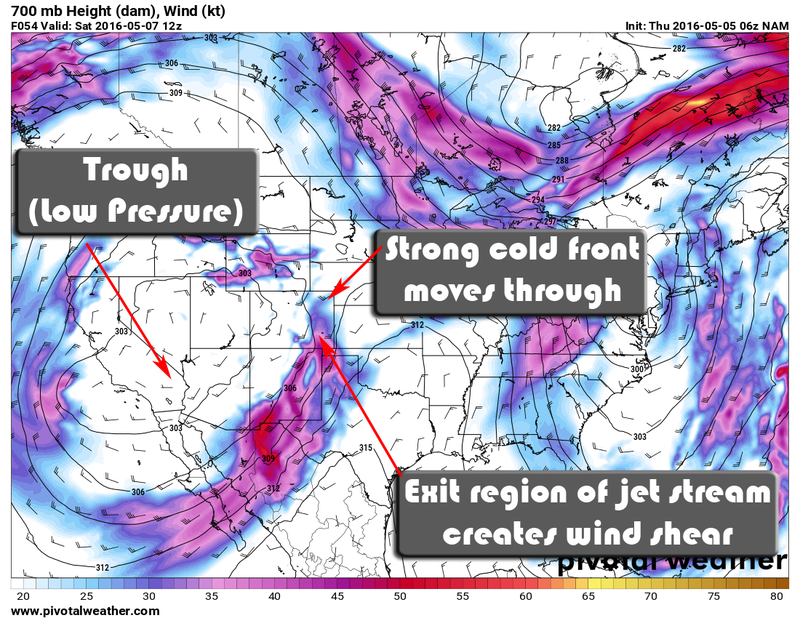 The red arrows in the image above point to an area of CAPE, lift in the atmosphere caused most likely be a DCVZ setup. We would expect these areas to be closely watched for the biggest storms. For this image, the higher the number the better the conditions for significant tornadoes. A threat does establish along that boundary zone for many on Saturday including Denver, Douglas, Arapahoe and Weld counties, but the number is overall relatively low. Still given that information, we cannot rule out the possibility of tornadoes. As we move through the day into the evening the threat intensifies but shifts East. Not all areas will see severe weather on Saturday, the SPC outlooks mentions slight risk because storms will be initially very spotty. However, those areas that do end up under these storms should be prepared. Large hail, deadly lightning and strong winds will be the primary threats most experience with these storms. That being said, given the information I outlined above, tornadoes cannot be ruled out either. If you have plans on Saturday, please keep an eye on the sky for these storms. If you see them building and moving over your area, be prepared to take shelter if needed. 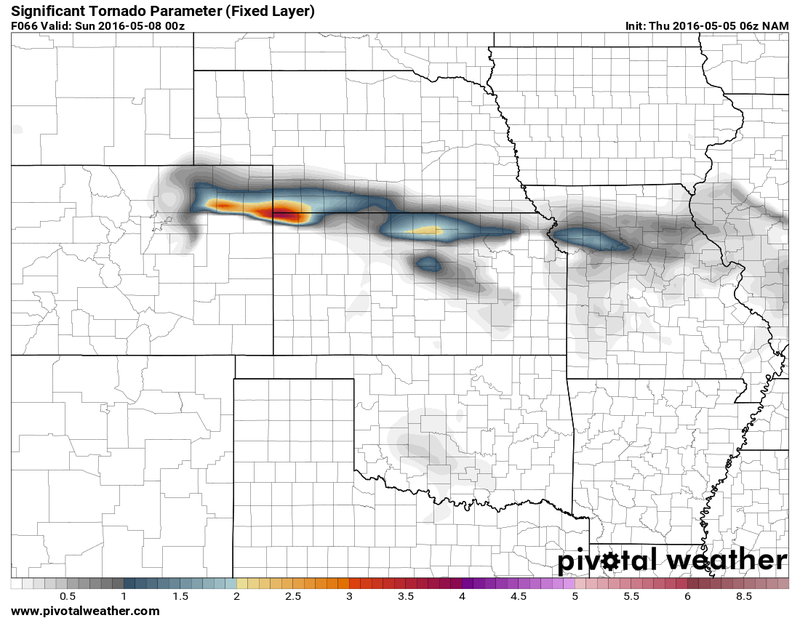 Have a severe weather plan in place! We will continue to monitor this setup through the next few days, stay tuned!